Over the weekend, I went to visit the two horses that had almost made the no return trip to Canada. First post here- https://dixierumble.wordpress.com/2010/02/07/blizzard-of-feb-2010/ They are hanging out on a gorgeous farm in Centreville, Md loving life. They have had a complete change in personality which is just wonderful to see. When they arrived you could not catch the bay horse nor get a blanket on him. Now they both wouldn’t leave us alone in the field and were so happy to get attention. We are hoping to find new homes for them. The bay has some large ankles but is sound on them. He will need a trail home. The grey is a bit sore in the knee so we are going to take a look at that and figure out what is going on. I truly think horses appreciate being saved from bad situations and these guys prove my theory! 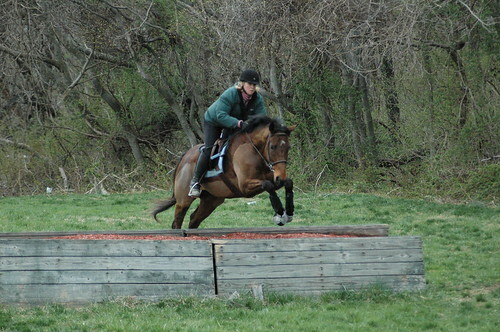 I also got to go x-c schooling with my mom on her CANTER horses. Flint hill and General Forrest (above link) were the first two CANTER horses that I worked with and I will always be linked to them. They came in to my farm in bad shape due to a bad boarding situation. Flint had the worst of it and was very poor, hair falling out, no muscle and not attractive. He was weak all over but his mind was always so good and he tried so hard. Someone was going to buy him but passed on him due to weak stifles. I convinced my mom to come and see him because in my opinion he was going to be the ultimate ammy horse. I am rarely wrong 🙂 He has turned out to be an incredible horse for my mom and watching him take her around makes me want to steal him back. She used to be afraid to jump but riding Flint gives her all the confidence in the world. I got a lovely report from Top Punch’s new owner and he is coming along really nicely. He had an injury to his check ligament possibly from stepping in a hole and had time off during the winter. He has been on stall rest and she has been riding him while on stall rest. She tells me that despite being stuck in a stall he is almost always perfectly behaved to ride. We went on a trail ride the other day and I have to say I was a bit in awe over how quiet he was heading off the farm for a walk trail ride while he has been on stall rest for 4+ months! There is always something to be said for a TB with a great brain. There is a ton of work that goes into finding homes for the CANTER horses but it is so worth it. 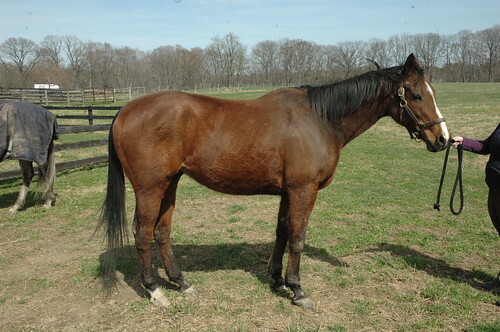 There is nothing that makes me happier than getting reports of former horses doing well in their new homes. Parker and Dee rocked this weekend! Sitting down to write up a little weekend report while I still have the energy for it. Saturday there was a hunter show locally so I decided to take Dee over to experience the atmosphere and figured I would take Parker as well just because I thought it would be interesting to see how he handled the chaos. People were very dressed up so I threw on my jacket but my tall boots are getting fixed so we weren’t really very formal! Dee got off the trailer with eyes as wide as can be and was sure she was at the racetrack. Tacking her up was quite funny as she wanted to stand still but couldn’t quite manage it and did some bunny hops up and down. Kurt and I were thinking it could be interesting. I took her to the outdoor ring which the racetrack goes around and she still wasn’t convinced we were not actually going to race. I walked her a few laps around and she could feel that she finally had relaxed. I don’t get nervous at all (well so I say :)) so it was not a big deal and I know my horses so I know what I can and can’t get away with. Many people were lunging but I don’t think my horses need lunging. I got on and she was perfectly fine! She actually went to work and was very relaxed about it all. Her lips were clapping together a bit but that is her nervous habit. They were having a little schooling break in the indoor so we went in there and this is where she really impressed me! There were tons of horses and ponies going every which way and lots of jumps crammed in there. There is an observation room along one wall and lots of people on the other side. She wasn’t bothered by any of it nor was she bothered by horses being silly around her. I decided to pop over a few jumps and although she has only jumped plain x-rails a few times she happily jumped around a little course of x-rails decorated with flowers. Nothing seems to bother her which is so nice. She then stood very nicely on the trailer while it was Parker’s turn. I didn’t actually show her in any classes because I thought she had enough for the day. Part of training the young horses is knowing how much is enough and not pushing to far past that limit. She got to see a lot and she was very good so best to end while you are ahead. Parker hadn’t been ridden in a week so he came out a little fresh but fresh for him is a big trot. He was a bit stiff going to the right and I need to do a better job yielding him over. I am still really riding him forward up to the connection and I know it isn’t smooth yet but we are getting there. When he gets truly over his back it feels incredible. He enjoyed himself which was fun to see. Today, Parker went out x-c for the first time in over a year I believe. 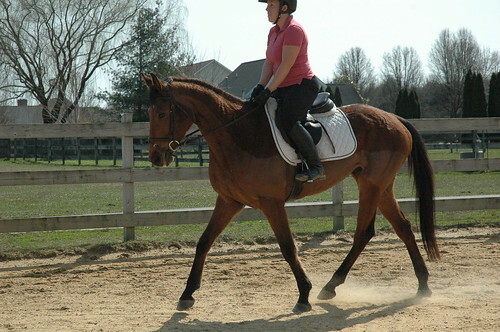 I think Allie had taken him when he first started under saddle but it had been a long time. The interesting thing about Parker is that he is always very quiet. Doesn’t care whether he is in the front or the back of the group or if he is alone while others go jump. That makes life much easier! 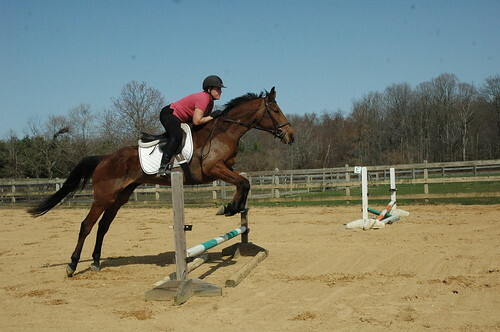 He started out jumping so green it was quite a challenge for me to get it together. He was almost stopping and then jumping straight up and down partially landing in the middle of stuff. I was using my stick but he was going huh?? Just not getting it but trying hard to understand. We eventually got it worked out and he was super good. He didn’t really stop at anything but keeping his feet moving was a challenge. He loved the water and dropping down and going up the banks was really nice on him. He took his time and just popped up and down instead of launching like some of them do. I prefer to introduce it all slowly and we didn’t jump anything to big because he was a bit cautious which is normal for a first outing. I bet next time he will come out much better. 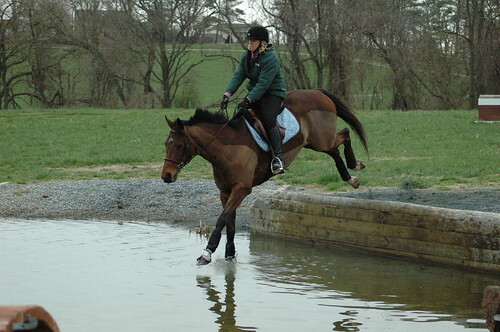 We just need to practice jumping a lot more which the weather has now allowed! 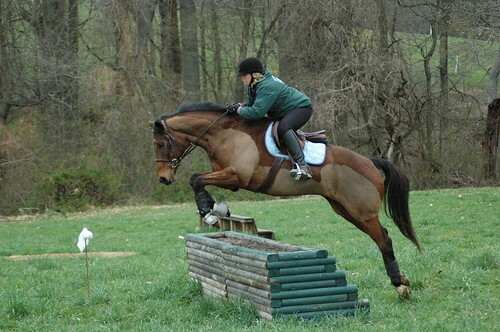 Um, look at the cute horse not a rider who got caught suprised by a huge launch! Parker has been giving me evil looks each time he is fed with his soup breakfast and dinner. He stands there looking around hollering like I didn’t feed him. Then when he does attempt to eat he paws the ground and bangs around on the walls letting out his frustration at the water in his food. It is really quite funny to watch him. I am getting ready to put some ad’s up for Dee on the internet today as she is ready to move on to a new home. There is a little local show this weekend so maybe she can go for a trip over there. I will have to look and see how that all works out. I put another clip of my lesson on youtube if anyone is interested. We were working on footwork using this really hard pole exercise. Charlie was really really good at it! 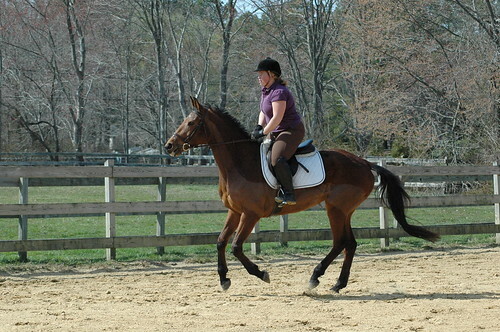 My mom’s boy was really struggling to keep the canter through it. Looks easy but trying to ride it was way hard. 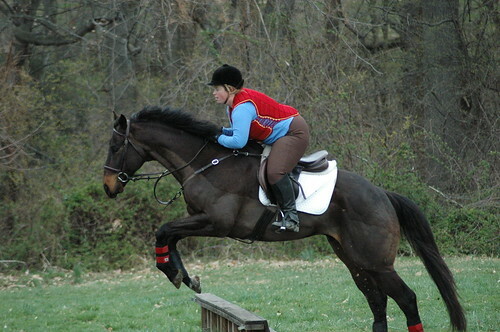 My jumping is so rusty having all winter off. I am going nuts not having my ring but they are coming today and the weather looks like it is going to stay good so let’s hope it is finished within the next week or two. Charlie has a very interesting story. 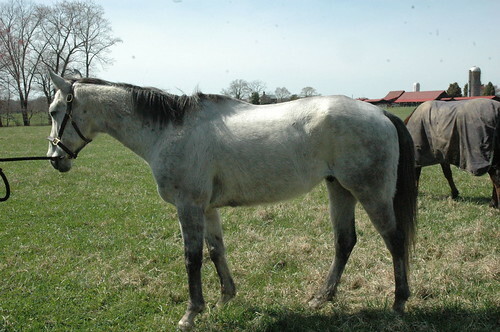 He is not a full Tb or maybe he is but the breeder told me is is an oldenburg cross. His father is Sam Huff, a son of unbridled. I bought him as a 3yr to resell but got busy and decided to send him off to a sales barn. That didn’t go so well and he came back pretty messed up. It took a year to get him back to the horse he used to be and I have been having so much fun with him I have just kept going. He has mentally grown up so much over the past year that riding him has finally become enjoyable not a battle of the wills 🙂 He used to be terrified of contact to the point he either put his head on his chest, would go sky high with his head or rear up. When you asked him to jump he jumped with his head in the air almost in your lap and it was just not a pleasant experience. Just goes to show how quick a nice horse can be screwed up. I blamed myself and vowed to restore his confidence and I think that has been accomplished. It has been a long journey but it is pretty cool seeing the difference in a horse when you know where you started. He used to tremble at the sight of a x-rail and we just came down and jumped the line of x-rail to oxer with him not even thinking. 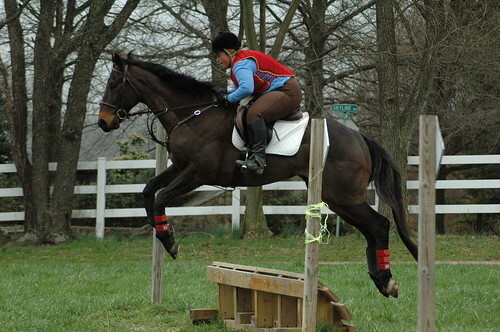 He jumped around BN last year cleanly which was a major accomplishment. He now loves trail riding and is happy in the contact. I always tend to learn the most from bringing along horses that have issues and my instructors have also enjoyed watching him progress. We all knew he was a good horse but just needed time to forget. He has the best personality and I just adore him. I really do need to sell one or both of my horses to pay for all these farm improvements but the hardest thing to do is sell them when you finally have them past the green stage. It is so nice to get on something that isn’t green or at least as green. I love my lessons with Mogie and can’t wait until Parker is going again so she can see how far he has come along. After a great Friday filled with fantastic rides on both horses I was truly looking forward to the rest of the weekend. My saturday started off pretty good teaching a lesson for the first time since November! My boarder traded horses with another one of my friend’s and it has worked out super well. She had a lovely older qh cross who wasn’t a fan of the dressage and my friend had a lovely quiet tb who wasn’t a fan of jumping. They traded horses and I think both got what they were looking for which is pretty darn cool. All of us are pretty excited to actually have 2 wks where we have been able to ride consistently. The horses are all a bit out of shape and the riders too 🙂 I love teaching and it is so much fun to watch the progress of horse and rider. It was my turn to head off to a lesson with my horse. My instructor was down for the weekend from Aiken which is exciting. She is excellent and always gets me on track. My horses are the least fit of the bunch since I always tend to focus on the sales horses/paid to ride horses. I do get on mine a few days a week and that should improve now that we have more daylight. We had a fantastic lesson really working on getting him straight and coming forward across his back. He is not fit enough to come much more uphill at the moment and he is the type that needs the stretchy work. 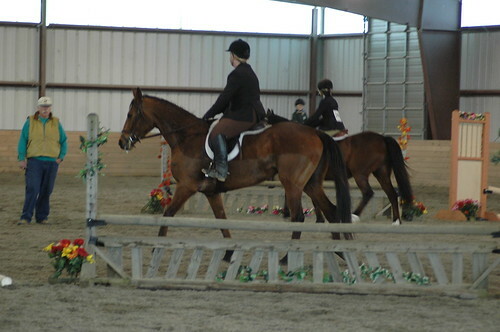 He has come so far in his training and is just a true pleasure to ride. Hard to believe he is a 6 yr this year. 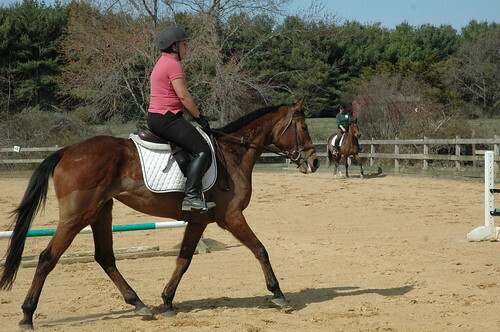 He is a sales horse…or so I say but I just love riding him. Here is a bit of my lesson if anyone wants to see. A great lesson was overshadowed by our truck failing once again. On the way to the lesson, the transmission was shifting in and out. We got there and the fluid was empty. Luckily, Mogie’s husband brought us some transmission fluid and we eased home. Looks like the line is broken so Kurt will have to fix that. That meant no x-c schooling on Sunday. I was bummed but no big deal. We got Charlie settled in and fed some dinner. We were cleaning paddocks when I heard that noise that almost always means choke. Hoping I was just imagining it I cleaned for another minute or so but then heard it again. Went off to investigate and saw Parker standing in the corner of his stall with snot coming out his nose. Gave him Ace and banamine right away but could tell it wasn’t going to resolve itself so we called the vet. It took the vet quite some time to get it dislodged (choked on wet senior feed) and it looks like he will now be off for 2wks while he gets soaked hay, soup for dinner and lots of antibiotics. Parker is the sweetest horse and I feel so bad for him. He is so good for all his needles and this probodics paste he gets at night. I think he will be just fine but from now on it will be soup for breakfast and dinner. He is an easy keeper only eating about 4lbs of day (combo of ration balancer and TC senior) but he does need some calories besides hay when in work. 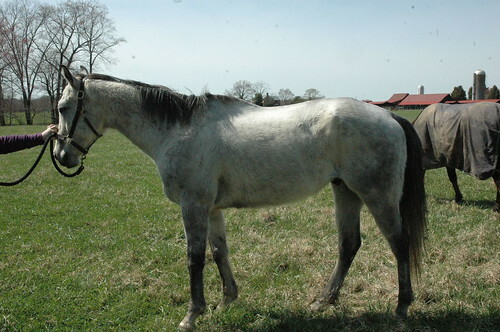 I get a bit frustrated that it is so darn hard to resale mares especially smaller mares. Everytime I get on Dee I think how smart, willing and quiet she is. Yesterday, we hauled her off the farm over to my mom’s house. She always starts off a tiny bit nervous but her form of nervous is a quick walk. She did that for about 2 min before she took a big breath and relaxed. All winter we have just been trail riding her to build condition and muscle. She is still way thinner than I would like but it takes time. She has built a lot of muscle and can now carry herself. Her hind end is still weak but again it just takes time..good old time does wonders for hind ends along with trail rides, small jumps, hills and raised caveletti’s. 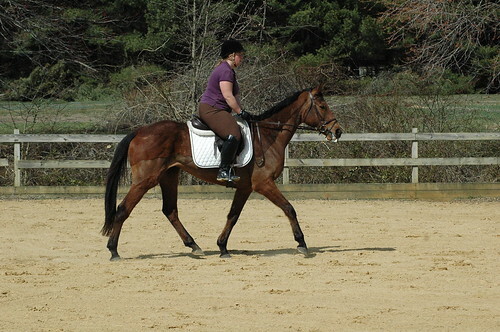 Of course nothing beats some good stretchy flatwork. Dee has only been in the ring twice before so this was her 3rd official ring ring ride and look at her go! She was figuring out how to stretch into the bridle and move forward. It is a bit over tempo right now but I am allowing her to go a bit more forward so she can push into the contact. She isn’t strong enough to collect yet. After I rode her then Tara got on and she was just as good for Tara and we were suprised how she just went into the contact for Tara who is not that experienced with that. She loves to jump and although the steering is lacking she is more than willing to do anything you ask of her. I have been away since Sunday for work and made a long trip to Morgantown, WV. It was a long but pretty drive. Thankfully, my training finished up early and I hurried home today to get some rides in. I took my horse out with my mom who brings her CANTER horses over to trail ride. Then my friend rode Dee and I rode Parker. I am trying to teach Parker that trails are fun but we also have to work a tiny little bit over the back. He HATES that and swears trail riding means loose rein and no real dressage work. Both Parker and Dee are just totally easy on the trails. Brave, not spooky, could care less about front or back, loose rein, happy to go whatever speed you ask and just plain fun to ride. This weekend looks like it will be busy. 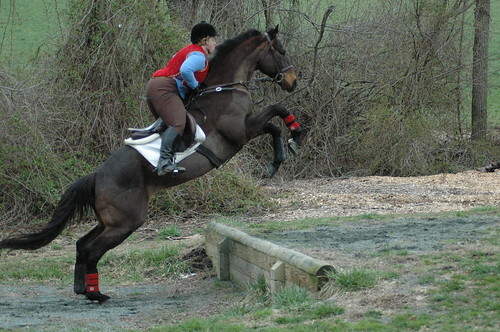 I am taking Parker to the schooling at St. Augustine Pony club and may do a lesson with him as well. I am going to try to take Dee to my mom’s farm to take some pics and video for her sales ad. It is time to get her advertised and into a new home. She is very simply and should be easy for someone else to take and get going. I hope to get on the new horse as well. 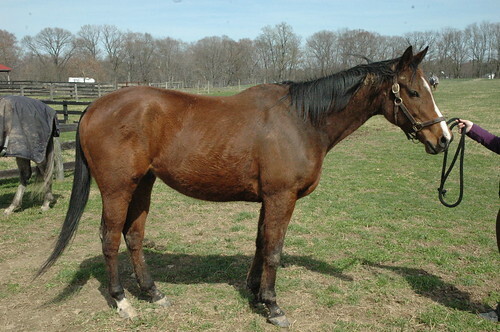 I will also have another horse coming in training early April. I donated a month of training to the CANTER auction and have been so excited to meet a new horse and owner. It only gets busier from here on out but I love it. I don’t know what the difference has been- saddle, bit, riding, chiro, feed or a program but Parker has become a different horse. It is so hard to describe how different he is to ride. He was like riding something that always was looking for a fight but waiting for you to pick it with him. He was on edge and unable to just enjoy the ride. 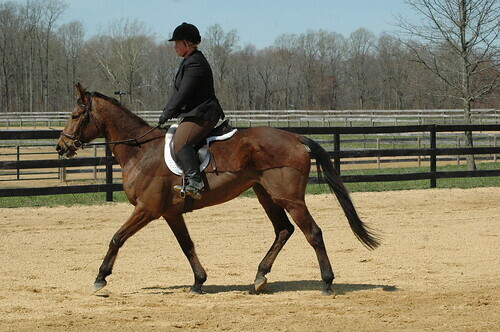 Now he is a total pleasure horse both in the ring and out on the trails. My mom wanted to come trail riding tonight and warned me her horse was going to be up so I picked Boppus (my horse) and Parker for my friend to ride. My friend hadn’t been on Parker before but Parker has been so perfect that I knew it would be fine. Sure enough my mom’s guy was feeling good and letting out some bucks (kicks maybe) and little spooks. 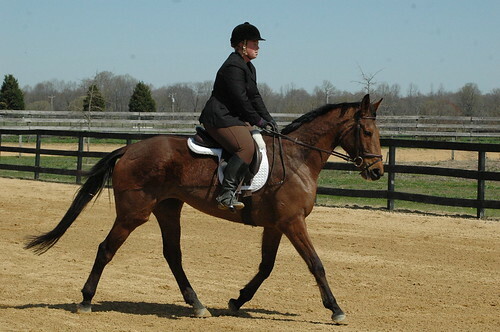 Parker was happy to just trot and canter along in the back on a loose rein. He is totally unphased by other horses being silly around him. At one point, my mom decided she needed to go for a good gallop so we just hung back and walked along happy to be riding such lovely horses. It is always a bit frustrating to me when people talk about “crazy” tb’s because I sure own a bunch that would defy that sterotype. Parker and Boppus were both decent racehorses with a lot of starts on the track and both are just relaxed and happy on the trails. I wish I could say mine had as soft as mouth as Parker but he just didn’t come that way. My friend is out of shape and did some bouncing around on Parker but he just plugged along. My instructions were to just let him do his thing which seems to work best for Parker. We all had a wonderful ride and it was so nice to enjoy the beautiful weather. 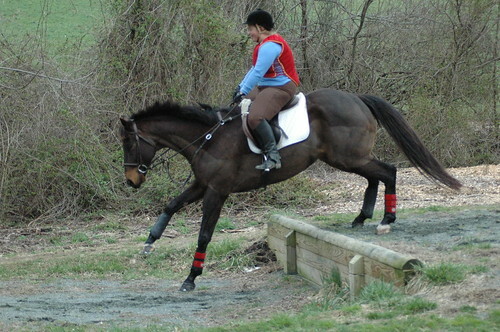 Parker needs a lot of these long trot/canter trail rides to get some better muscling and fitness. There is nothing better than good trot sets to build fitness. He is also self loading on and off the trailer and has become much better mannered. He loves people and I love him. What a cool horse and I am really happy he is in my barn.